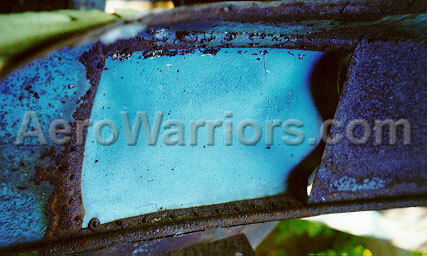 Aero Warriors - The Real #88 Chrysler Engineering Daytona! The Real #88 Chrysler Engineering Daytona! As the 1968 season got underway, Chrysler's fortunes on the NASCAR tracks appeared to be changing. Their success of the past few seasons was fading fast - about as fast as the new, relatively sleek Ford Torinos and Mercury Cyclones. The "aerodynamically challenged" '68 Dodge Chargers were no match for the competition, and they would need more than a styling face-lift to make them competitive in 1969. The decision was made well up the Chrysler food chain in early 1968 that something needed to be done....and it was. 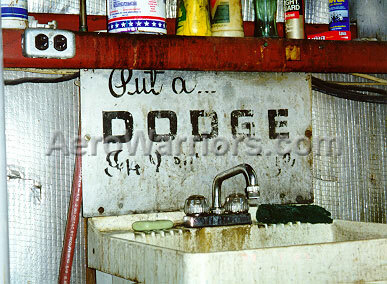 Enter Larry Rathgeb and Chrysler's Special Vehicles Group. They were charged with designing and building a car that would put Chrysler back in victory lane in 1969 - consistently. Work was fast and furious throughout much of 1968, and the 1969 Dodge Charger 500 eventually emerged from the chaos. Hopes were high for the car, but unfortunately its speeds were not, and Ford captured the 1969 Daytona 500 - it was back to the wind tunnel for Chrysler! Development on what would eventually become known as the Dodge Charger Daytona actually started before the 1969 Daytona 500, as Chrysler had planned for the possible release of a 1970 model that would be a successor to the 1969 Charger 500. After the Daytona 500 disaster however, this proposed '70 model quickly became a '69 1/2. The Special Vehicles Group had only a handful of months to get the Daytona ready. Two cars were used during the Daytona development effort at Chrysler's Chelsea Proving Grounds. The first, a "slow speed" car, had originally been a '68 Charger driven by Charlie Glotzbach in NASCAR competition. Chrysler's modifications to the car eventually caused it to be outlawed by NASCAR, and it was then made available for Proving Grounds use. It is sometimes seen in photos on the banks of the Proving Grounds track, dressed in red paint and wearing the #71, with a rather small wing on the rear. Second was the "high speed" car, which was phased into service as testing at racing speeds became necessary. This car reportedly began life as a '69 Hemi Dodge Charger 500, one which Chrysler loaned to a magazine for testing. The car was stolen while the magazine was using it, stripped and left on a Los Angeles street. Chrysler brought the shell back to Michigan and earmarked it for Proving Grounds use. Charlie Glotzbach and Buddy Baker were eventually chosen to drive the high speed car, as they were among the most experienced and winning drivers in the Dodge stable. The first high speed tests were conducted with the prototype Daytona on July 20, 1969 - the day of the first moon walk. Additional testing was conducted in August of 1969 at Daytona and Talladega, and also later in the year at Rockingham. On September 10, 1969, Charlie Glotzbach qualified the high speed car on the pole (199.466 MPH) for the inaugural Talladega 500. The #88 was first seen on the car at this time - it was provided by factory car builder Ray Nichels, as it was necessary for the car to have a number before it could be qualified. A walk-out of the race, due primarily to the driver's concerns about tire safety, kept the car from competing. The #88 Chrysler Engineering Daytona was assured a place in stock car racing history on March 24, 1970, when, at Alabama International Motor Speedway, Buddy Baker drove the car to a closed course speed record of 200.447 MPH - making it the first stock car to officially break the 200 MPH barrier. This is almost certainly the greatest moment in the short but storied history of the Chrysler aero cars! And so ends the tale of two test cars.....for a while. Shortly after the International Motorsports Hall of Fame and Museum at Talladega opened in 1983, a #88 Daytona was donated for permanent display. This car was generally thought to be the actual Chrysler Engineering test vehicle that had such a distinguished racing pedigree, but rumors eventually surfaced concerning the car's true heritage. 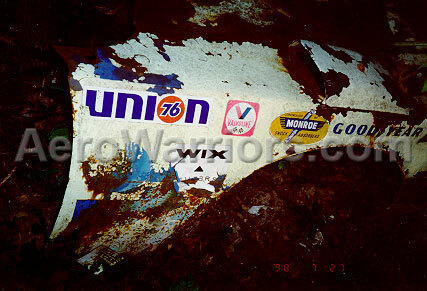 This was briefly discussed on the Aero Warriors site in 1997 on the #88 Daytona page. Thanks to a recent and truly remarkable discovery by winged car enthusiast Tim Wellborn, we now have a much better idea as to the true identity of the #88 museum car. Tim located a Chrysler internal company memo from July 31, 1970 that discusses the possible donation of a Chrysler vehicle to NASCAR. The memo recommends painting the #71 test car to make it look like the #88 high speed car before donation takes place. Although no documentation is known to exist that records the disposition of what is proposed in the memo, it would seem reasonable that Chrysler acted favorably on the recommendation offered in the memo. If that is the case, then it appears certain that the #88 Daytona at the International Motorsports Hall of Fame and Museum is in fact the #71 slow speed test car. So what happened to The Real #88 Chrysler Engineering Daytona? On July 31, 1998, Chrysler employee and winged car expert Greg Kwiatkowski answered this question in very dramatic fashion. 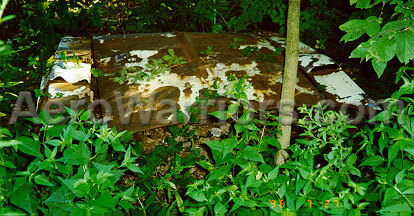 What follows are the details Greg has relayed to Aero Warriors about the winged car find of a lifetime! Sometime prior to the '71 racing season, the #88 Chrysler Engineering Daytona was turned over to veteran USAC racer Don White, as part of a contract settlement with Chrysler. This exchange was arranged by Ronnie Householder, Chrysler's head honcho at the stock car tracks. Don campaigned the Daytona throughout the '71 USAC season wearing a light yellow and black paint job and sporting the #5. The car made appearances at Milwaukee on three occasions, and once at both Brooklyn, Michigan and Pocono, Pennsylvania. The car's third place finish at Pocono was its best that year. White drove a different car in 1972, and then old #88 was pressed into service again, this time wearing '73 Charger skin. It was raced on the dirt in 1973, 1974 and possibly 1975, and was then parked by White next to his race shop. And there it remained for a quarter century, as anonymous as if it were in a Government witness protection program. Greg Kwiatkowski works at Chrysler's Auburn Hills facility, and had heard in passing from Larry Rathgeb that the #88 Engineering car had been given to Don White, not donated to NASCAR and then later to the museum. In the Fall of 1997, Greg decided to contact White and ask about the car. Don reported that yes, he did end up with the Engineering car, he still owned it, but that it was not for sale. Greg then began working a delicate balancing act, regularly contacting Don about the car by phone, while trying not to be a pest. Eventually the phone calls paid off, as Don expressed an interest in selling. Greg immediately made arrangements to pick up the car, and on July 31, 1998, the former #88 Chrysler Engineering Daytona was on the move again, back to Michigan where it had made so much history almost 30 years before. So, let's take a look at some of Greg's photos. You may "click" on an image to see a larger version of that image. And if you happen to have a copy of Frank Moriarty's book, Supercars, The Story of the Dodge Charger Daytona and Plymouth SuperBird, you might want to have it handy too. This is the #88 Chrysler Engineering Dodge Charger Daytona as it looked when Greg purchased it on July 31, 1998. 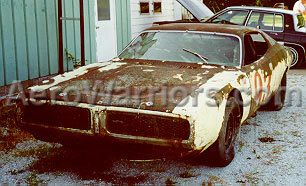 It is wearing '73 Charger skin, as Don White last raced it on dirt in the mid-'70's and then parked it. Although re-skinned and modified in several areas by White, the chassis itself maintains much of its integrity from the Chrysler Engineering years. The car had no motor when this picture was taken. 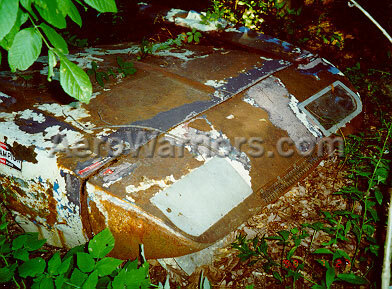 Probably not what you would expect to come upon in the woods - the front clip from arguably the most significant winged car of them of all! Here's a closer look at the driver's side portion of the nose. 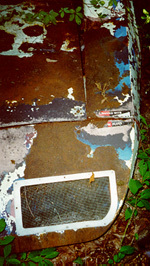 Blue paint, the same color as found on the #88 at one time, can be seen here in several areas on the fender. Greg has determined that the car actually wore two shades of blue during its tenure as the test car. It sported a B5 Blue Fire Metallic hue though testing at Chelsea and qualifying at the Talladega 500. Between this time and when it made the record 200 MPH run on March 24, 1970, the car was changed to a lighter Corporate Blue color. The roll cage itself was never changed to Corporate Blue - it was kept the original B5 Blue color throughout its lifetime with Chrysler. A better look at the nose, and this time from the front. It's hard to believe that this is the same nose that routinely survived 200 MPH plus speeds! Don White painted much of the Daytona a light yellow in 1971, and some of the faded paint can be seen here. 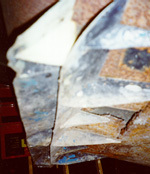 Blue paint and bondo is also in evidence. Now a shot from the back of the nose cone assembly. Note the duct work inside the nose cone, which was used to direct air to the radiator and oil cooler. The radiator diffuser duct work (used to distribute air from the relatively small opening in the front of the nose cone to across the entire radiator) was installed in 1970 sometime before the 200 MPH run at Talladega. This is a view from under the nose, looking at the spoilers. That's right, there are two. Greg reports that the one in back was on the car when Baker set the 200 MPH record. The smaller spoiler in front was added by Chrysler later in 1970. Blue paint is noticeable on both pieces. This is the #88 nose to radiator valence piece, setting in Don's shop behind a sink. It was used for over 25 years to keep water off the wall! And if you have the Supercars book available, this is the same piece that is pictured on page 46. 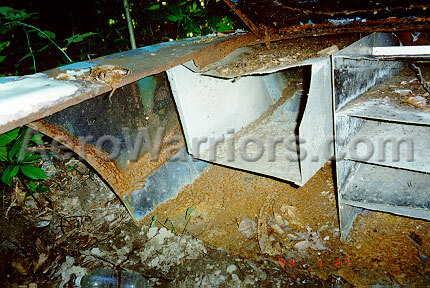 This is the driver's side vertical stabilizer. The black paint is cracking, revealing the Chrysler Engineering white paint underneath. Also notice the four Dzus type fasteners, two of which are visible in the center of the wing, with the other two a few inches above the base. 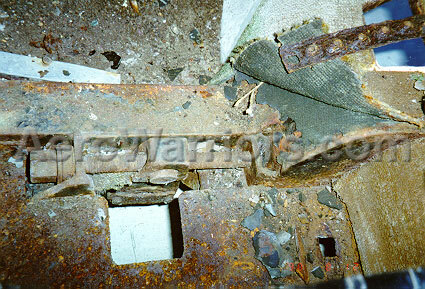 These fasteners allowed the wing to be quickly removed from the car, and have only been found to date on the Engineering car. The two fasteners in the center of the wing, as well as one of the two near the base can be seen in a photo found on page 108 of the Supercars book. A hood pin close-up. Note the blue paint. Underneath the fender scoop. These openings were reportedly added to the fenders strictly for tire clearance. Greg has some Chrysler documentation calling that belief into question, but he wants to save that story for another time...! This is the inside torsion bar adjuster, found only on the driver's side and located in the floor pan area just ahead of the seat. Greg indicates that it is five inches from the top of the cross-member to the bottom of the torsion bar - a unique Engineering car feature. Notice the hole partially visible behind the pit directions placard. 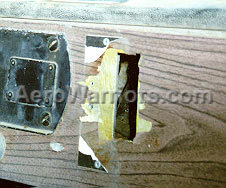 This is where the buttons were housed that controlled data acquisition equipment found on the passenger side floor pan area or in the trunk. Information about shock travel, steering input, wind speed, air temperature, etc. could be gathered using these electronics. 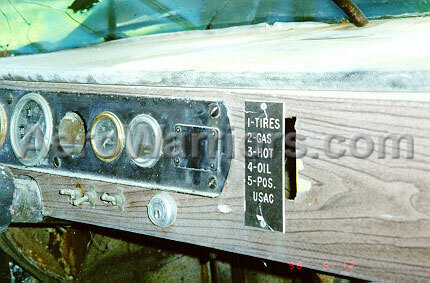 Page 99 of the Supercars book contains a photo clearly showing these buttons. 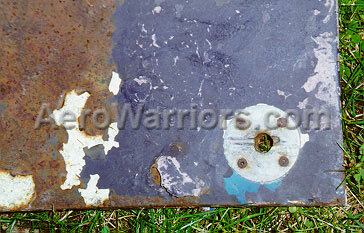 This is a close-up of the button area with the pit directions placard removed. The location of the two rivets (they are clearly visible in the page 99 Supercars photo) holding the button array in place can be seen here an inch or so to the left of the button hole. Also, the large switch (which controlled the #88's fire suppression system) shown in the Supercars photo is gone - as seen in this photo, a black plate covers the area now. While doing research on the #88 Daytona, Greg has had occasion to speak to many people. Among the most interesting is retired Chrysler employee Jerry Wenk. Jerry was one of two test drivers for the #71, and he also did "shakedown" work in the #88 before Buddy Baker and Charlie Glotzbach stepped in. Wenk did his final work in the #88 at 180 MPH or so on July 19, 1969, and then vacated the car for Glotzbach's first high speed runs the next day. How tight was security at Chelsea Proving Grounds during this testing? Jerry was not permitted to be at the track to observe the Glotzbach runs, even after spending so many hours in the car preparing for that moment! A significant footnote has now been added to the Chrysler racing history books. The #71 has been discovered to have been hiding in plain site, and in a rather ironic twist, as the other winged test car. And in an even more dramatic development, much of the genuine #88 Chrysler Engineering Daytona has been found and will eventually be restored to its former appearance - the appearance of the most famous winged car of them all! Greg is also the owner of an extremely rare prototype Daytona racing wing. It was mounted on the #88 during some testing sessions and may have also spent time on the #71 slow speed car. Information about this wing first appeared on the Aero Warriors site in 1996. Keep in mind that this 1996 article was written two years before the real #88 was found and the true identity of the #88 museum car was discovered.